This past weekend at the University of Findlay, sheep breeders, judges, and enthusiast alike joined for a day filled with wool sheep breed judging advice, knowledge, and experience. The focus of this workshop was to expose judgers how to appropriately evaluate fleeces and wool sheep breeds. The main speaker for the day’s event was Mr. Dave Clouser. Dave is a long time sheep breeder and judge that has had a lifetime of experience evaluating wool and wool sheep breeds. Dave began the day by explaining the differences between wool and meat breeds of sheep as well as their place in the sheep industry. Focusing on wool breeds, which are common breeding sheep projects for youth, Dave explained the inverse relationship between wool quality and animal size. 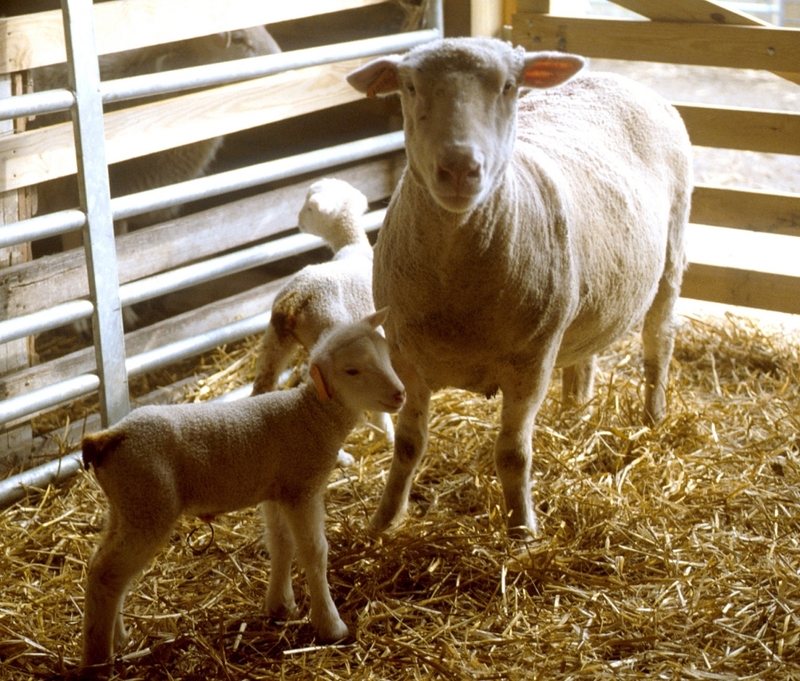 Typically, in a sheep breeding show, the largest framed or heaviest muscled sheep is desired. However, Dave explained that as animal size increases, wool quality decreases because the wool becomes courser. This is an issue with wool breeds. Therefore, Dave noted that when evaluating wool sheep breeds, size, conformation, breed character, and wool quality all play an important role in the ranking of a class. When compared to meat breeds, wool breeds differ as the wool is fitted for show. 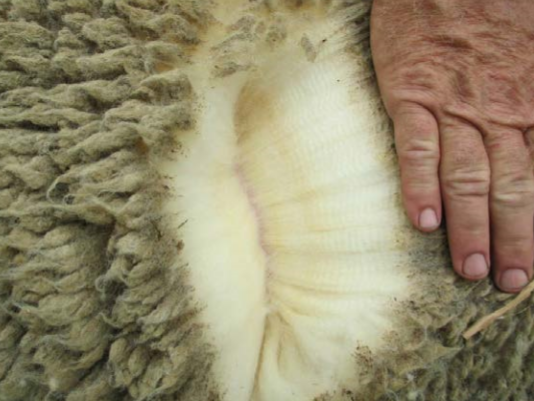 Therefore, caution should be taken when evaluating wool breeds as wool can hide many faults. Be sure to handle all sheep and closely evaluate the way each animal moves. Wool can also be used to detect faults. If a sheep has a topline that is not level, on the move the wool may part revealing this fault in the sheep. Once you have made your evaluation of conformation and structure, it is then time to evaluate the fleece. When evaluating the fleece of an animal, it is important to look for consistency. Is the fleece consistent from front to rear and top to bottom? When evaluating for consistency, be sure to look at the fleece at several different places on the animal (3-5 locations) to gather an overall representative sample. Belly wool is also a major defect when evaluating wool. Belly wool, which Dave described as looking like steel wool in appearance, may be present in other locations, such as the side (lower 1/3 of the body) of the sheep. This is a major fault as belly wool decreases the value of the fleece due to the coarseness of the fibers. In addition to belly wool, kemp can also be a major defect. Kemp can simply be described as hair. If kemp or hair is found in the fleece, this will significantly devalue the fleece as well. The tighter the crimp, the finer the fiber. The images illustrates this as Merino sheep are a fine wool breed whereas Romney sheep are a course wool breed. Additional characteristics, which contribute to the overall appearance and quality of the fleece, include size, boldness, and quality of crimp (the natural waviness of the wool fiber), size of lock in course wool breeds, density of fleece, and fleece uniformity. When evaluating crimp, the bolder the crimp, the courser the fleece. This feature would be undesirable in fine wool breeds. Staple or fleece length may also contribute to fleece quality. Fleeces should be 3 inches in length. 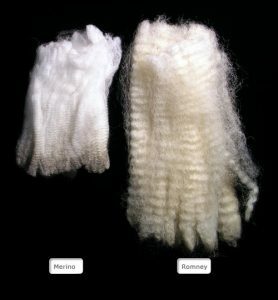 Fleeces that are less than 3 inches in length are undesirable from a commercial standpoint at wool processing facilities and in the show ring may be used as a tactic to hide faults. For example, a fleece may be trimmed short on the side of a sheep in order to make the encroaching belly wool appear the same as the rest of the fleece. As an evaluator, you must make an appropriate decision based upon what you see on the sheep in the ring at that moment . Also, when evaluating natural colored sheep, lighting is key. If lighting in the show ring is limited, be sure to find the most light in the show ring and use that area to evaluate the fleece. When put in a situation like this, you must adapt to your environment. Evaluating wool sheep breeds can be difficult as many breeds have different score cards and values for points based upon specific criteria. Prior to judging a wool sheep breed show, be sure to familiarize yourself with the breed and the type of wool you would expect to see. When evaluating livestock, be sure to prove positive and corrective reasons that can be taken by the producer and used to improve upon in the future. Editor’s Note: For the full presentation from the day’s event, please follow this link. Posted by Braden Campbell at 8:00am January 4, 2019 Posted in Wool and tagged Wool. Bookmark the permalink.